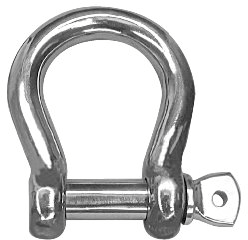 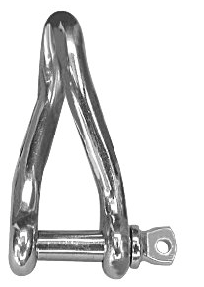 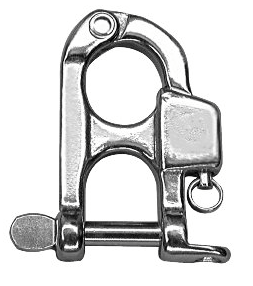 A pin shackle is closed with a clevis pin. 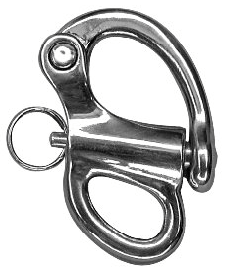 Primarily used above the deck, pin shackles used to be the most common shackle used aboard boats. 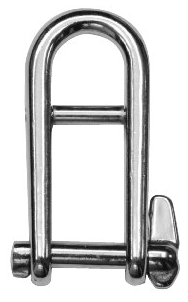 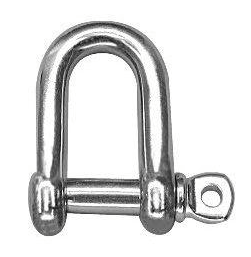 Pin shackles can be inconvenient to work with at times because they are secured using something else, usually a cotter pin or seizing wire. 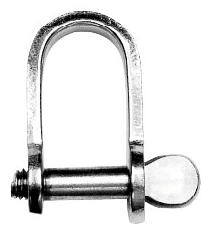 The pin is threaded and one leg of the shackle is tapped. 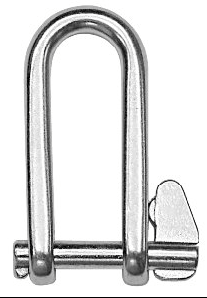 The pin may be "captive", to prevent it from dropping loose. 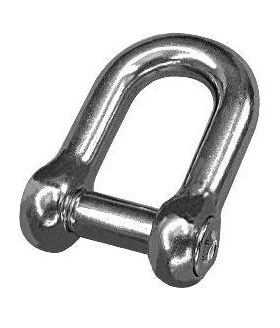 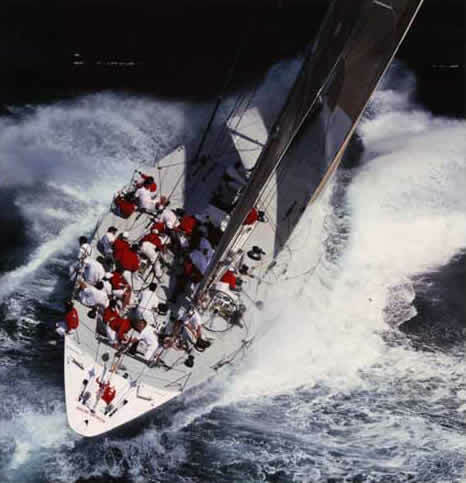 The threads may gall if over-tightened or have been corroding in the salt air, so a liberal coating of lanolin or a heavy grease is not out of place on any and all threads. 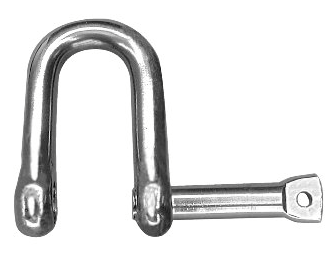 A shackle key or metal marlinspike are useful tools for loosening a tight nut. 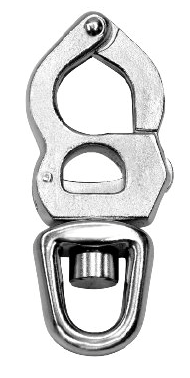 As the name implies, a snap shackle is a fast action fastener which can be implemented single handed. 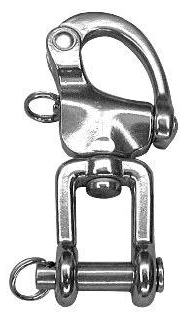 It uses a spring activated locking mechanism to close a hinged shackle, and can be unfastened under load. 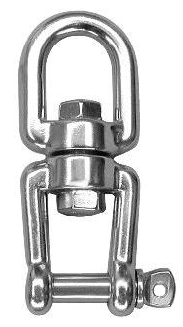 This is a potential safety hazard, but can also be extremely useful at times. 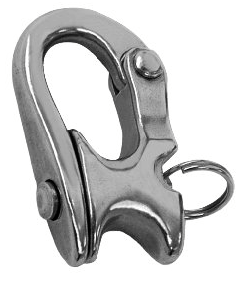 The snap shackle is not as secure as any other form of shackle, but can come in handy for temporary uses or in situations which must be moved or replaced often, such as a sailor's harness tether or to attach spinnaker sheets. 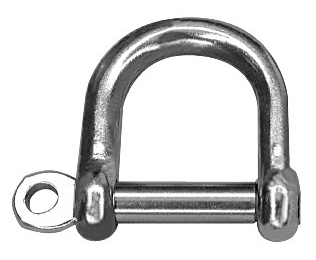 Note: When this type of shackle is used to release a significant load, it will work rather poorly (hard to release) and is likely to have the pin assembly or the split ring fail. 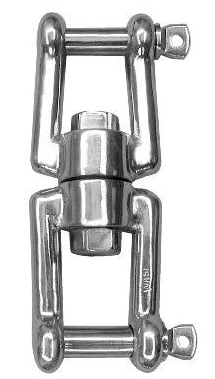 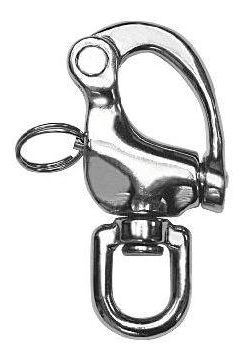 Swivels, eye and eye are applied in applications where a quick swivel assembly with a hook or quick link is required. 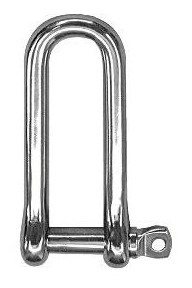 Swivels, Jaw and Jaw are applied in applications where quick assembly onto a closed end chains is required.